Arizona' vast lands hold many secrets. 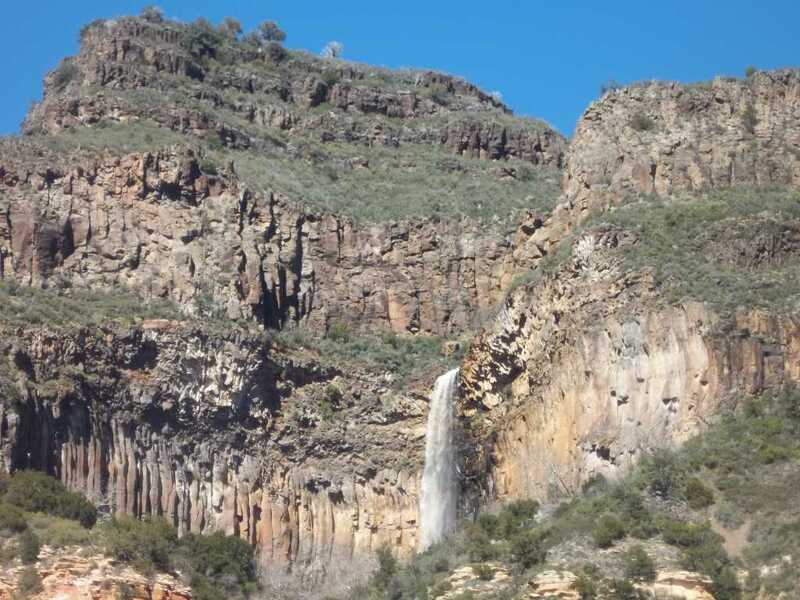 One of the best kept secrets in our neck of the woods is the "now-you-see-it, now-you-don't" Encinoso Waterfall in Oak Creek Canyon a scant few miles upstream from Sedona. It takes a very special set of circumstances to bring this secret into the light of day. First, it takes a big wad of snow sitting up on the Mogollon Rim. Second, it takes either A) rainfall on the snow or B) a lot of sudden heat to flash melt the snow. Typically, it's rain on snow that brings this awesome secret to life. In such a case, low clouds often give the waterfall an ethereal appearance but the sky is gray. Rare is the day when Encinoso is running big under a Bright Blue Bird sky. We had no doubt that Encinoso was exposing its secret self yesterday. We scurried up canyon to watch in awe as water poured off the sheer precipice of the Rim. Only two other humans were there to watch the show. Meanwhile, who knows how many thousands of people passed by without a clue that one of the finest fresh water cascades was performing in broad daylight almost right beside the busy highway US89A. Encinoso is one of the best Signature Secrets of this entire region. Often years may pass between the few times Encinoso will be up and running with glory and grandeur as it was yesterday. Who knows who long it will be until Encinoso appears again? One thing's for sure, when Encinoso's running, John and Susun will drop everything and run fast to get there to see the secret unfold!